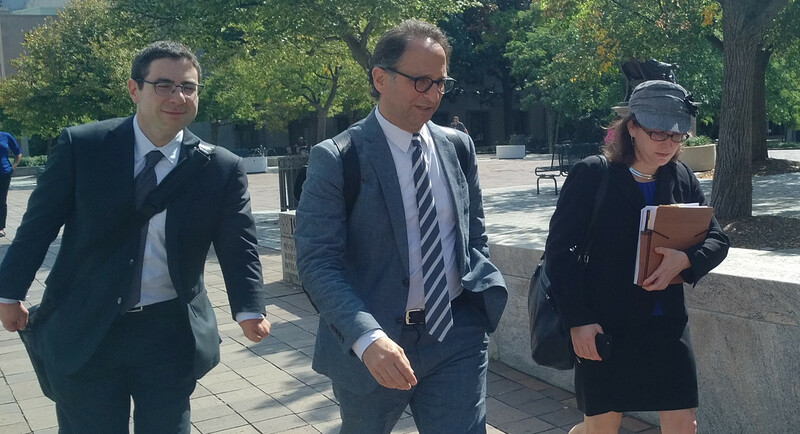 Three prosecutors working for Trump-Russia Special Counsel Robert Mueller, Adam Jed, Andrew Weissman and Kyle Freeny, depart U.S. District Court in Washington Friday. Yet another Hillary Clinton and Barack Obama donor has been picked to work on special counsel Robert Mueller’s team of Russia investigators. The latest hire is Kyle Freeny, a Justice Department attorney working in the agency’s international money laundering unit. According to Politico, Freeny on Friday attended the grand jury testimony of Jason Maloni, the spokesman for former Trump campaign chairman Paul Manafort. Politico notes that Freeny is the 17th attorney identified as a member of Mueller’s investigative team. Freeny, who joined DOJ in 2007, has something in common with at least eight of her Mueller team members. According to documents maintained by the Federal Election Commission, Freeny has donated in each of the past three presidential elections to Democratic nominees, Barack Obama and Hillary Clinton. She donated $250 on three separate occasions, on Sept. 13, 2008, June 30, 2012 and Sept. 9, 2016. For seven months in 2011, Freeny worked as an attorney in the Obama White House on security clearance issues. Some Republicans, including President Trump, have criticized the Mueller team over its Democrat-heavy roster. While Mueller himself is a registered Republican, the nine lawyers who have given to Democrats have shelled out nearly $65,000 in donations altogether.